This ghostly little plant is nearly invisible if you peer at it from directly above. The teeny tiny flowers (we're talking mere millimeters here) wash into pebbles against a backdrop of sand. While picking up one of my dog's droppings, I noticed one the other day, the flowers vibrating in the wind, hovering over the ground as if suspended in midair without scaffolding. Crouching down, I saw the thread-like limbs, and then saw that I was surrounded by an army of these camouflaged p(l)ants. I went out looking for that same patch this afternoon, but was unable to spot any due to the low contrast resulting from overcast skies. Yet again, tending to my dogs, I noticed a twitch out of the corner of my eye, a little like psychedelic pattern shifting. There they were, those invisible little flowers, dancing their jittery two step back and forth, bringing granules of sand in and out of focus. I struggled to pin down a precise classification, so many micro factors that I won't begin to list. I chose this species because the involucre (base of flowering head) is kind of hairy (not smooth like E. reniforme) and fairly wide (2mm vs. 1.3mm in E. thomassii) But if you know it to be otherwise, please correct me! 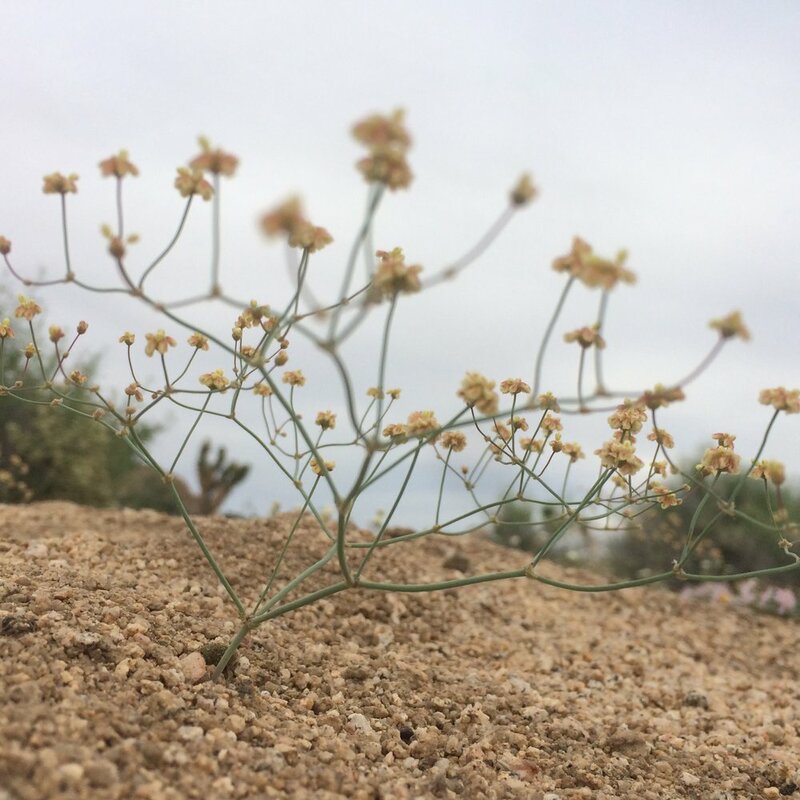 The genus Eriogonum contains over 250 species, so look closely!